Candace H. Johnson-For Shaw Media Teachers Michael Dean and Stephanie Kaye work with their eighth grade students on how to use Google Classroom on HP ProBook x360 Notebook PC laptops at Gavin South Middle School in Ingleside. 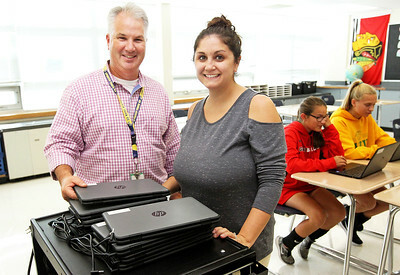 Dean and Kaye raised $7000 through private donations and a GoFundMe campaign to purchase the Chromebook laptops for their students. 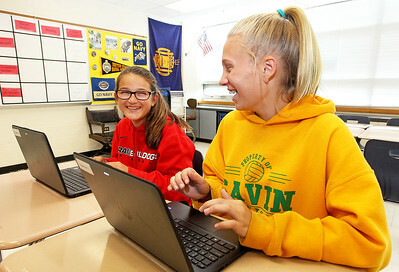 Candace H. Johnson-For Shaw Media Eighth graders Miranda Rodriguez, 14, and Cora Hughs, 13, share a laugh while working on brand-new HP ProBook x360 Notebook PC laptops at Gavin South Middle School in Ingleside. 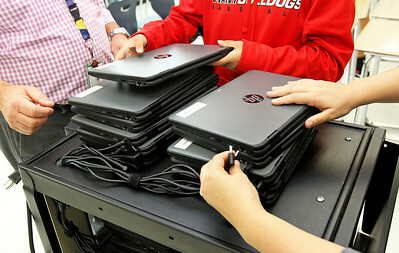 Candace H. Johnson-For Shaw Media Eighth grade teachers Michael Dean and Stephanie Kaye stand next to the HP ProBook x360 Notebook PC laptops they bought for their students after having raised the money from private donations and a GoFundMe campaign at Gavin South Middle School in Ingleside. Candace H. Johnson-For Shaw Media Keith Kratz, 13, of Ingleside gets some help from Stephanie Kaye, an 8th-grade Language Arts teacher, using an HP ProBook x360 Notebook PC laptop at Gavin South Middle School in Ingleside. Kaye helped to raise $7000 to get Chromebooks into the classroom. Candace H. Johnson-For Shaw Media Eighth grade teachers Michael Dean and Stephanie Kaye wait for their students to put back their HP ProBook x360 Notebook PC laptops on the cart at Gavin South Middle School in Ingleside.Both Dean and Kaye raised $7000 through social media and private donations to bring the laptops into the school.